So many people really do consider Jeremy Corbyn to be the definite article. That's certainly the state of politics today in England, if not the United Kingdom. But when it came to this Jeremy Corbyn speech in Coventry today we've got a case of the indefinite article. We all know the uncertainty, fears and doubts that surround all things Brexit. So the recent Brexit reconciliation speech from Boris Johnson, a Vienna speech by David Davis and Theresa May's Security Conference Speech were organised to set out both vision and objectives. Well, that was the plan at least. And we have heard some fine words. But we've also heard some weaselly words. The verbal equivalent of sleight of hand. And that's fair enough. Because we expect it. But now, with the Jeremy Corbyn speech in Coventry today we are in a wholly new area. Grammar. No, not grammar schools. Because grammar schools might well be contentious. But they aren't nearly like as contentious as this point of grammar. 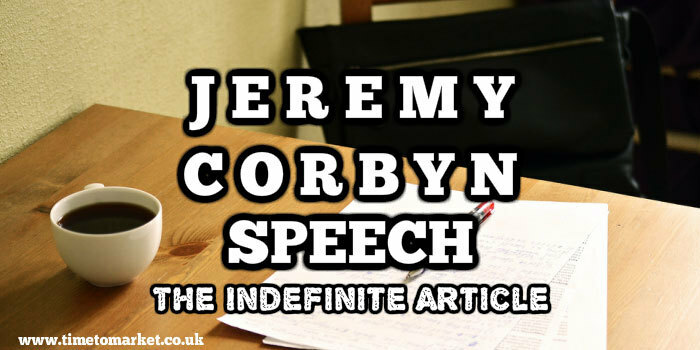 Because in this Jeremy Corbyn speech we have the grammatical indefinite article, loud and proud. No, it's not Article 50, it's the indefinite article. Politicians and commentators have skirted the matter for weeks now. But now we've got it. So, it's absolutely clear. "We will join in a customs union." But the country is still in the dark about what this divided government wants from Brexit. Speaking from autocue Jeremy Corbyn appeared calm and confident with this speech. Yes, we heard a few stumbles. But they were not a problem. This Jeremy Corbyn speech had a central purpose and plenty of structure signposting throughout. We heard plenty about the race to the bottom and for the many not the few, but there was also clear material here. So, there you have it. A customs union. Not the customs union. All clear? No? Thought not. But, aside from the fun with grammar this proved a good, well-constructed Jeremy Corbyn speech. You can always discover plenty of public speaking tips and techniques with our regular series of posts, podcasts and videos for public speakers. And, when you are ready to be the definite article, in Coventry or elsewhere, you can always join us on a public speaking course. Please don't hesitate to get in touch when the time is right. Will Corbyn Conference Speech Heal Labour Rift?